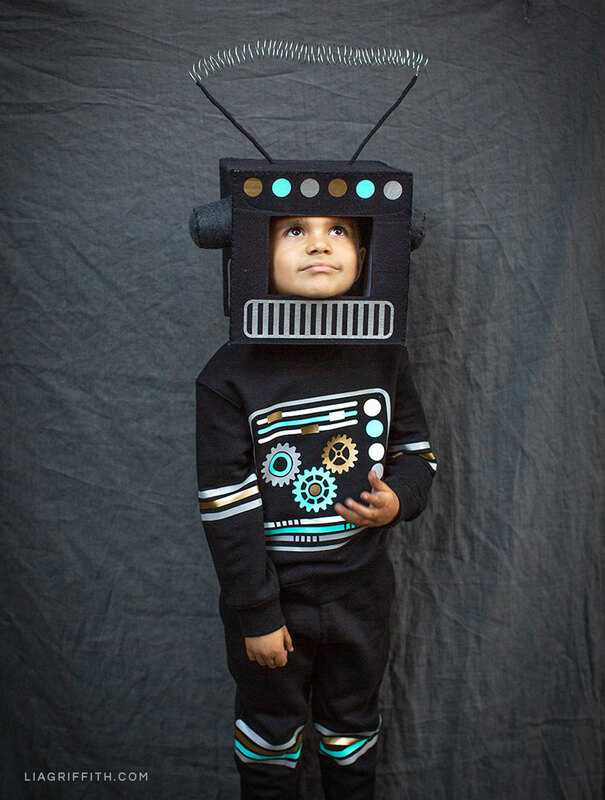 Looking for a cute and creative Halloween costume? 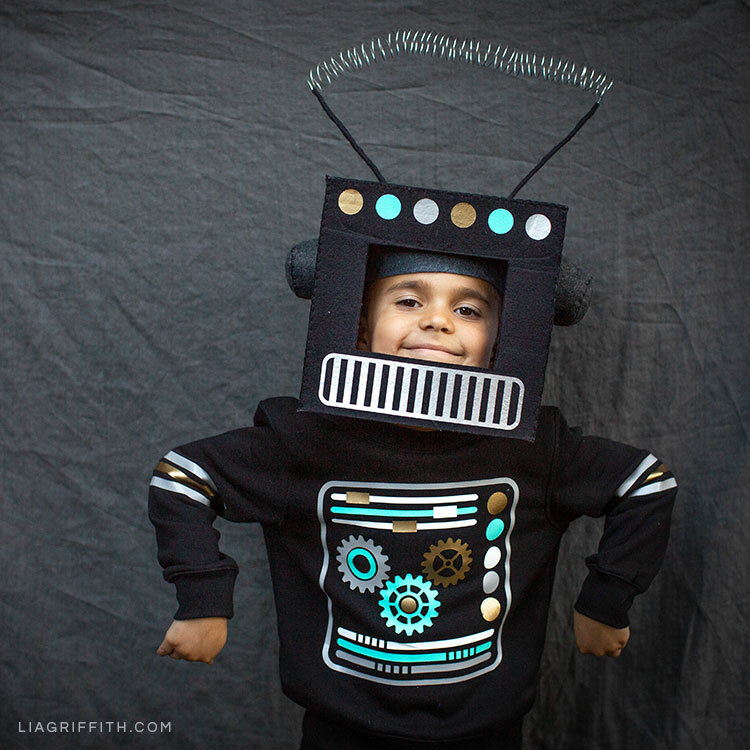 Our DIY robot costume is perfect for kids. Just look at how happy our little model is! 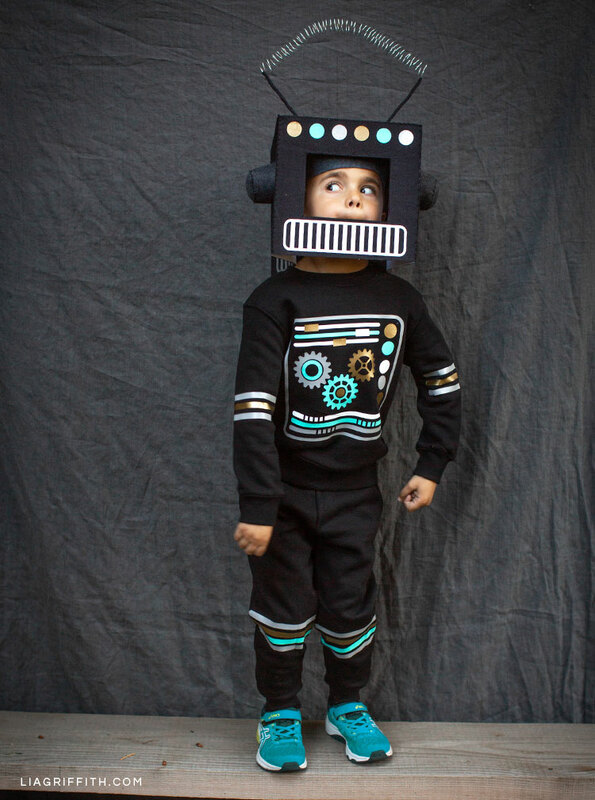 If you want to make this robot costume for your own kiddo, just follow our simple tutorial below. 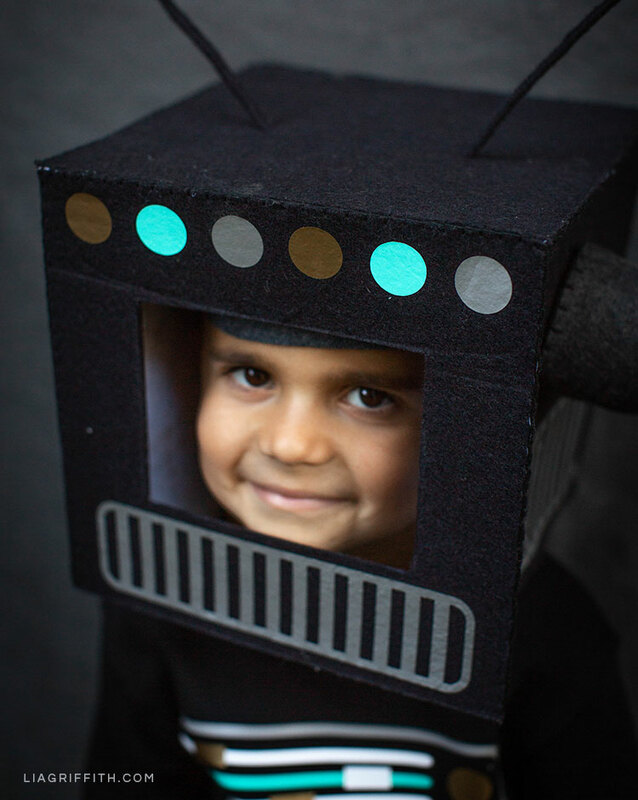 Although we used quite a few tools and materials for our DIY robot costume, don’t let that deter you! This Halloween costume is very easy to make. 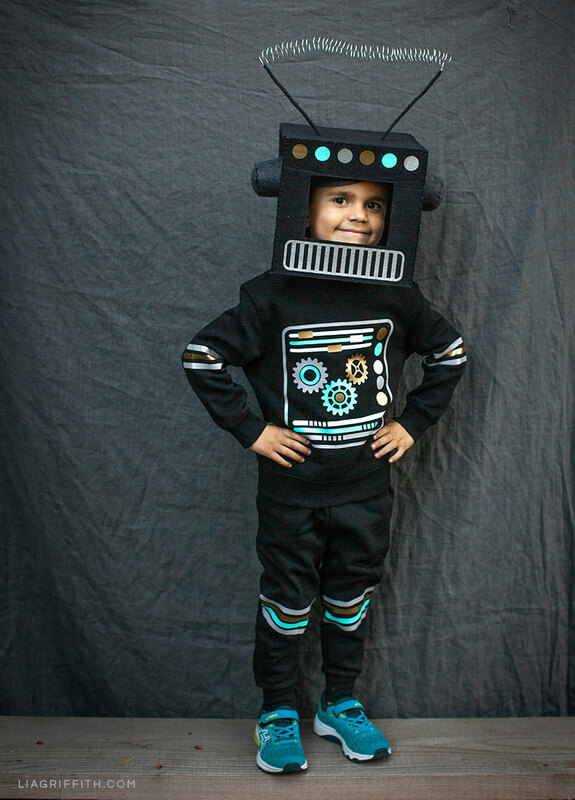 We made our robot costume with black felt as well as a few different colors for the iron-on designs. You can find the exact colors linked below, but you can also use whatever colors you like best. Or you can always get your little one’s input, too, of course! 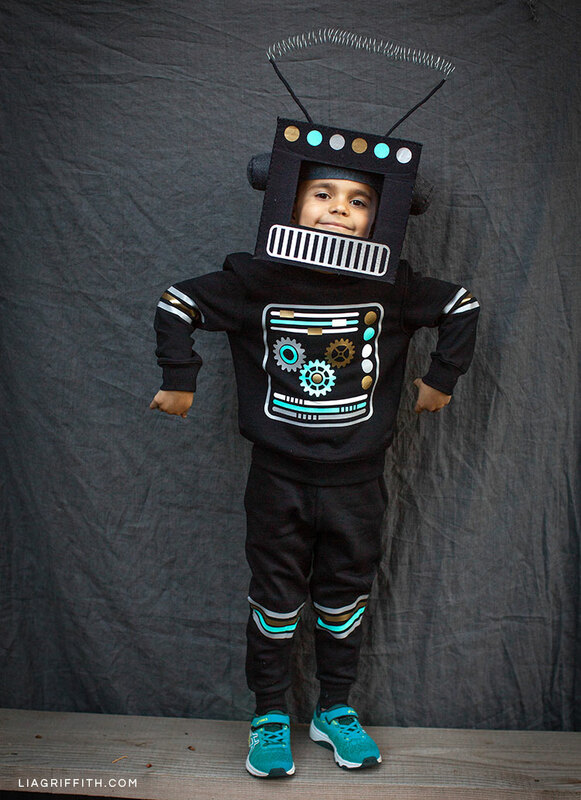 Once you’ve gathered the tools and materials for this DIY robot costume, make sure to download the SVG file or printable PDF for both the robot head and the iron-on designs. You can also download the instructions for this costume and follow our step-by-step photo tutorial. 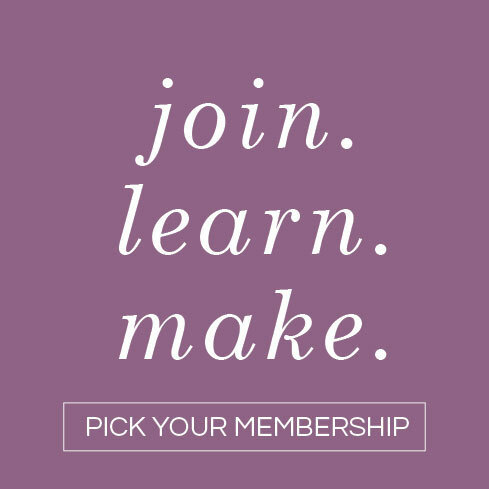 If you have any questions, we’d be happy to help! Just leave us a comment below. Gather tools and materials. Then download the template below. 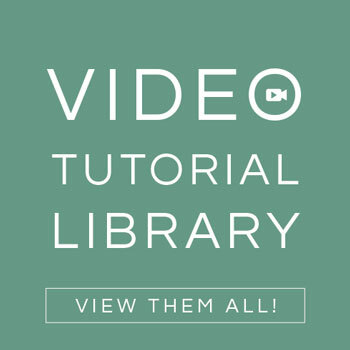 Cut materials according to template notes using scissors or a cutting machine. Then, cut five 9″x9″ squares of felt. Using an iron, attach fusible interfacing to the two larger circles for each of the ears. Sew the ears into shape using a blanket stitch; sew the smaller circle on first. Continue sewing along the straight edge, then begin sewing the larger circle on and stop before you finish. Finish sewing the ear closed, then repeat with the second ear. 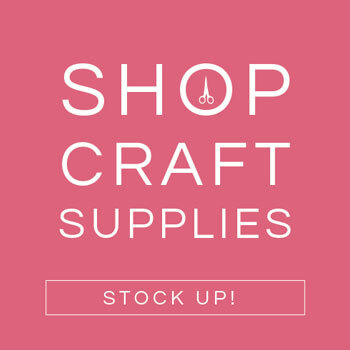 Attach fusible stabilizer to all five 9″x9″ squares and trim the edges clean with scissors. Cut a 5.5″x4″ rectangle into the face of the robot using a rotary cutter. Iron on the robot head details following the iron-on instructions. Using a blanket stitch sew the face and 3 sides of the head together. Sew the top of the head onto the top edge of the face with a blanket stitch. Sew the remaining 4 edges together to create a box. Then, using hot glue, attach the ears to either side of the robot’s head. Wrap the wire around a broomstick to create a 12″ coil. Straighten 6″ of wire on either end of the coil. Use hot glue to attach the felt strips around the 6″ straight wires on either side of the coil. Push the wire through the top of the robot head. Bend each end of the wire and use hot glue to glue them into place on the inside of the robot head. You can find all of our Halloween DIY projects here. We’ve got Halloween costumes for kids, adults, and pets! And if you love to decorate for Halloween, you’ll find plenty of ideas to help you with that, too. For more DIY inspiration, make sure to stop by our social pages to see our latest Halloween projects. We’re on Instagram, Pinterest, Facebook, Twitter, and YouTube.